Menopause: Biology and Pathobiology is a comprehensive volume covering all aspects of the biology, anatomy, physiology, pathobiology, and pharmacology of menopause, as well as its diagnosis and management. The book is divided into four sections: Basic Biology, Epidemiology, Menopausal Systems Pathophysiology, and Intervention. Basic Biology covers such fundamentals as ovarian anatomy and physiology, mechanisms of steroid hormone action, chronobiological effects, and premature menopause. Epidemiology includes, among others, chapters on methodology challenges in the study of menopause, how to distinguish the effects of age from those of menopause, and a discussion of the key differences in demographics, environmental factors, and ethnicity in the menopause experience. The Pathophysiology section contains chapters on menopause and its various effects on the body, including sexuality, skin, brain, the cardiovascular system, cancers, and mood. 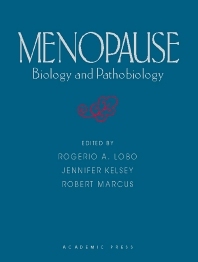 The final section includes detailed chapters on intervention and management techniques, with topics including alternative therapies to hormone replacement, exercise, and estrogens and osteoporosis. Researchers, professionals, and academic clinicians in endocrinology, public health, obstetrics and gynecology, epidemiology, and related desciplines. Basic Biology: The Molecular Pharmacology of the Estrogen and Progesterone Receptors. Ovarian Anatomy and Physiology. Regulation of the Hypothalamic-Pituitary-Gonadal Axis: Role of Gonadal Steroids and Implications for the Menopause. Gonadotropins and Menopause: New Markers. Genetic Programming in Ovarian Development and Oogenesis. Neuroendocrine Regulation of the Perimenopause Transition. Changes in Men as They Age: The "Manopause." Premature Ovarian Failure. Perimenopausal Changes in FSH, the Inhibins and the Circulating Steroid Hormone Milieu. Epidemiology: Methodologic Challenges in the Study of Menopause. SWAN: A Multi-center, Multi-ethnic, Commnity-based Cohort Study of Women and the Menopausal Transition. Demographics, Environmental Influences, Ethnic And International Differences In The Menopausal Experience. Distinguishing the Effects of Age From Those of Menopause. Menopausal Systems Pathophysiology: Menopausal Hot Flashes. Menopause and Cardiovascular Disease. Insulin Resistance, Body Weight, Obesity, Body Composition and the Menopausal Tradition. Influence of Estrogen on Collagen. The Growth Hormone IGF-I Axis and Menopause. Bone & Calcium. Menopause and the Skin. Estrogen Therapy and the Brain. Gyno-Urinary System. Is There a Relationship Between Menopause and Mood? Immunologic Aspects of Menopause. Cancers. Sexuality. Intervention: Historical Perspectives. Prevention Trials in Perimenopausal Women and Postmenopausal Women. Estrogens: Different Types, Properties. Progestogens. Androgens. The Alternative Therapies to Hormone Replacement Therapies. Calcium Nutriture: A Model System for Understanding Menopause-Nutrient Interactions. Exercise. Estrogens and Osteoporosis. Osteoarthritis and Menopause. The Epidemiology of Cardiovascular Disease and Postemenopausal Hormone Therapy. Interventions for the Control of Symptoms. Effects of Steroids on Mood/Depression. Hormone Replacement Therapy and Breast Cancer. HRT and Risk of Endometrial Cancer. Risk of Pulmonary Embolism/Venous Thrombosis. Combined Estrogen-Androgen Replacement Therapy: Benefits and Risks. Biology of DHEA. Menopausal Issues for Older Women. Decision Analysis Applied to Postmenopausal Hormone Replacement Therapy. Dr. Lobo, formerly Rappleye Professor and Chair of the Department of Obstetrics and Gynecology, and Director of the Center for Reproductive Sciences, Columbia University, has done extensive research in various areas of reproductive endocrinology and infertility including estrogen metabolism and menopause. Dr. Lobo has a primary interest in hyperandrogenic disorders and polycystic ovary syndrome. He frequently serves as editor for peer-review journals and has authored over 300 articles and 16 books. Department of Obstetrics and Gynecology, Columbia University College of Physicians & Surgeons, Columbia Presbyterian Medical Center, New York, NY Columbia University, New York, U.S.A.